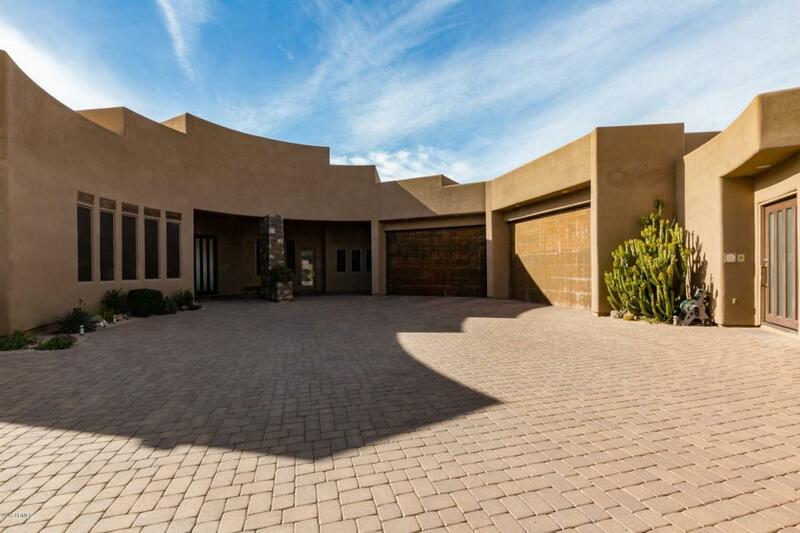 Outstanding Contemporary Custom Home surrounded by Mountain, City, & Sunset Views. Exquisitely designed by Nick Tsontakis, award winning Architect. This amazing Home offers SOLAR, high-end finishes, lots of natural light throughout, 4 fireplaces, arched ceilings, soothing palette, gorgeous stone floors, upgraded lighting/ceiling fans, new surround sound, Architecturally & Aesthetically STUNNING! One of a kind gourmet kitchen features granite work counters, center island w/butcher's wood top, breakfast bar, built-in SS appliances, patio access/views, and plethora of wood cabinetry with stylish hardware. Perfect Home for entertaining! Retracting Wall of Glass, sparkling pool, spa, built-in BBQ, roof deck, covered patio and a Beautiful Guest House! See it...Love it...Live it! Cross Street Westland Rd & N 83rd St.